My reading guide for the Road to Revolution has greatly helped to improve test and quiz scores by forcing students to look deeper at vocabulary by giving the definition as well as an application--much like an AP style free-response question. 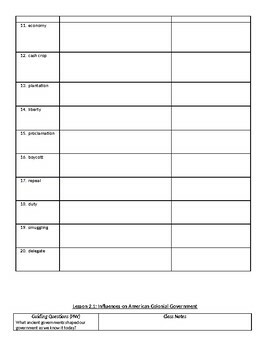 This reading guide covers the factors that caused the American Revolution all the way to the Declaration of Independence. 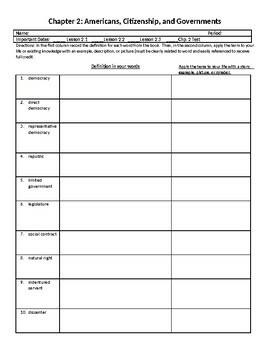 Students also have homework questions that correspond to essential questions within the text. 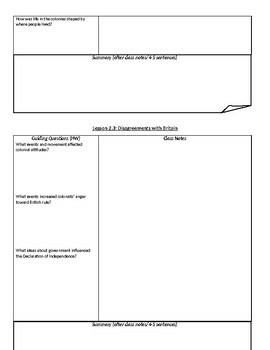 The reading guide uses a modified Cornell note-taking style with a space for notes and a space for a summary of the day's lesson. 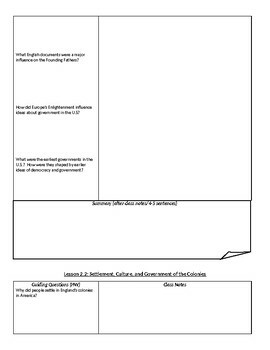 The reading guide also includes deep-processing questions that include political cartoons and document-based questions that give students the opportunity to apply what they know about the topic and are a great way to introduce more difficult material to students who are ready to go to the next level history course. This has helped to increase overall comprehension of material and my test/quiz scores have gone up significantly. The reading guide is aligned with McGraw Hill Building Citizenship: Civics and Economics but could easily be modified to fit any text.